“Now do the Harlem Shake”: probably the most popular sentence in YouTube country these days. And it is a fact, indeed: the Harlem Shake is everywhere. As soon as you go through your Facebook updates, surf to a news website or simply watch some YouTube videos, it’s impossible to not bump into one of the thousands of parodies of the Harlem Shake. Originally, the Harlem Shake dance style was introduced by Al B in 1981 in Harlem, New York. In 2001, the dance appeared in a lot of hip hop video clips, e.g. P. Diddy and Jadakiss, but today, the Harlem Shake has become a worldwide phenomenon where you just have to wear a motor helmet, shake your shoulders and torso on the “Harlem shake” song of Baauer, make everyone around you act like a complete fool, record it and share it with the world. 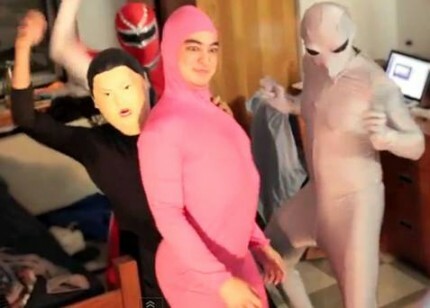 The video that started this “Harlem Shake” craze was posted on January 30 by college student George Miller. Miller has been posting comic videos since 2008 and thousands of people are following him. In his video of January 30, Miller and three of his friends are dancing around on Baauer’s song in colourful jump suits, for only 19 seconds. But a couple of hours later already, a fan of Miller had posted a reworked version of his video; a three minute Harlem Shake video. And so the hype began. However, the hype did not start because of spontaneity, but because of what corporations did with it. Maker Studios (a company that specializes in making money from YouTube, partly owned by Time Warner) for example uploaded their own version of the Harlem Shake with Maker Studios staff dancing in their office. Then they promoted the video across their many YouTube channels as well as on Twitter. Not much later, a lot of other companies such as IAC and Buzzfeed started posting and promoting their own Harlem Shake videos as well, all of them with one single purpose: to promote themselves. And that’s when the big hype began. Normally, imitations are first done by professionals and only later by fans and amateurs. In this case however, it all began with an amateur, his imitation and rapid replications driven by media and marketing professionals and all of this led to thousands of videos and parodies worldwide. Everyone is doing it: from the British army to Ed Sheeran to the girl next door. So, when is it your turn? Result of writing this blogpost: can’t get the song out of my head..